Well we're going to have to wait a bit more because We're getting Lostbelt 3 soon! I never knew I needed a twin-tailed, glasses [redacted] until today. 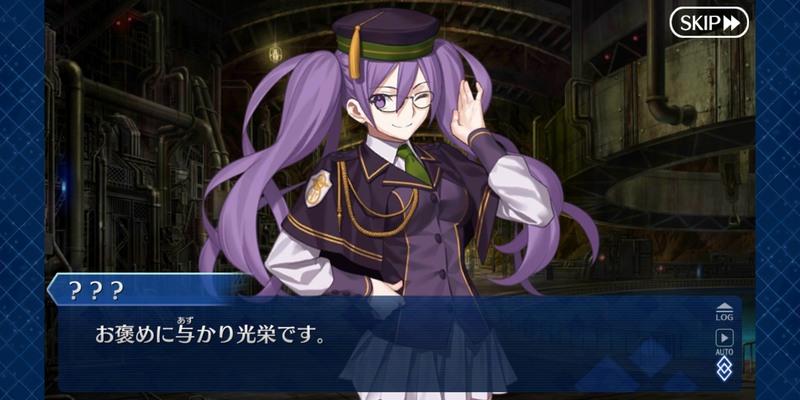 Maintenance is over, Christmas is here, and also the Heroic Costume: Medusa CE has untranslated card art its info page and such are all translated at least, but I wonder why the name on card itself was untouched. Edit: Just got booted out of the game an hour later for an update, now the CE is corrected. 10 tickets to try make my farming easier, got one 4 star event CE and Ishtar. So what Free Missions are best for farming? Also, animation updates for Jing Ke and Spartacus. Didn't get an Ishtar or any rare servants from the gacha unfortunately (probably my luck rebalancing itself after drawing two Vlad Extras in the Halloween event), however I did manage to draw two of the 4* event CEs and four of the 3* CEs. Good old God Force; but damn it, still just shooting an arrow?! Make one single roll on Lostbelt 3 from login quartz and Xiang Yu shows up. I appreciate the thought after you gave me so much pain in the story, but I was really hoping for one of the others. Oh well. At least he should make good friends with CuZilla. Hang on to your butts, Babylonia is en route for NA servers. Basically this, but without double waver. I'm not sure how, but on a whim I opted to use that summoning ticket you get from the last event quest on the story gacha. Used my summoning ticket on the Event Gacha… Rolled Ishtarin, who is my first 5* Archer. Am I going to get them all? Welp, I managed to get a fifth Drunk Jeanne Alter on my very last fight. So much for that, but at least I have an MLB one for next year. Edit: Finally done with the main story of Babylonia. Welp, JP Christmas is entirely different than expected. In EN news, is anyone else intentionally taking the hard difficulty fights? RIP THAT pattern, I guess. At least it means it'll be less predictable. But now, every xmas after santa alter has involved a Babylonian servant... Gil santa soon? Or maybe Tiamat? if that golden nightmare dares touch my holiday, i'm adding delightworks to the fight on tokyo tower list. Ruler Class Quetzalcoatl (Samba Santa). Finally cleared Babylonia, and honestly, I'm looking forward to see how they can top this. Yoshitsune has made me dump so many resources into taking them down. So brutal. Also I need to remember to bring in multiple healer/regen-types because screw that noise. Cleared Babylonia w/o using any Command Seal, though there were a couple of times I barely won. It was kinda funny watching Ruler Martha beat down Tiamat considering the difference in sizes. I liked using Sanzang. "I punch you into the mountain! I punch you into the mountain again! I'm just a Caster; how am I punching you all the way into the mountain a third time?!" I went full tanky with Medea Lily and Mash, but it was basically overkill. Fate/Kind Order is starting to unnerve me, Bradamante get. How am I getting all these 5* without whaling? Tried a 10-roll for Lucoa-neesan, got Fuchou instead... I'm not sure what that says about my luck. I have no idea how I managed it, but I tried the ten-pull for Gorgon and managed to get her. I'm so happy right now (especially since I now have an Avenger).